A cultural exchange intended to immerse ArtChangeUs attendees in the Lakota story also worked to empower individual Native artists. Molina Parker (Oglala Lakota) came into the space at Racing Magpie in Rapid City, South Dakota for a collaborative art piece with Tasha Abourezk (Three Affiliated Tribes). Together, they drew people with ArtChangeUs REMAP into a group project that bonded them. First Peoples Fund welcomed the REMAP program to Lakota Territory in Pine Ridge and Rapid City, South Dakota, where everyone experienced a greater understanding of the climate, the people, and one another. 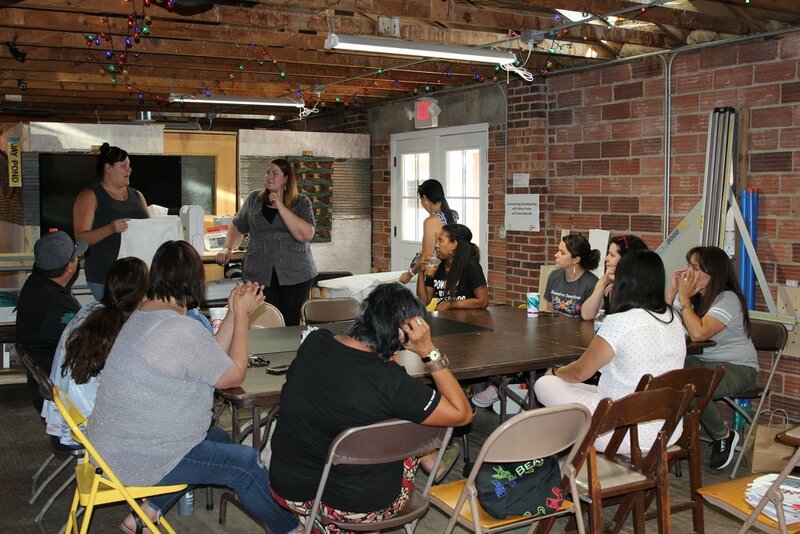 ArtChangeUS REMAP: Pine Ridge: “Reclaiming Our Way of Knowing” engaged Native and non-Native artists, educators, activists, and changemakers in two days of immersive cultural experiences. The REMAP: Pine Ridge program encompassed diverse cultures and brought together people from New York, Hawai’i, Alaska, and places in between. Representatives from valued First Peoples Fund partners such as ArtPlace America and the Bush Foundation joined in the REMAP effort. We welcomed many who haven’t had the opportunity to visit the area. This led to connecting our artist fellows with larger national organizations. “Many hands went into the effort, and it showed in every way,” Roberta says. An initiative based out of the California Institute of the Arts, the ArtChangeUS mission is to reframe the national arts conversation by embracing the cultural assets of demographic change. REMAP is one of their primary programs. It focuses on bringing together an exceptional mix of leading artists, activists, scholars, and changemakers for cultural exchanges. This was fulfilled in Lakota Territory with artist workshops, poets, educators, and other passionate presenters. The experience brought a better understanding for visitors of how much the area has to offer. In a full immersion experience that included grounding at He Sapa (Black Hills), the group had the opportunity to visit the Pine Ridge Reservation and Red Cloud Indian School Heritage Center. The project served to remap and recreate the image of Lakota people and their lifeways in modern times. While Native people honor and preserve traditions — mainly through art — their lives today are far removed from the romanticized version so firmly embedded in mainstream culture. The workshop, led by Molina and Tasha, of creating quilt squares mixed with beading was a representation of how art can reshape demographics and bridge gaps. Tasha is sewing the pieces together to form a wall hanging as a reminder of the shared experience during the workshop. The REMAP: Pine Ridge program ended with time spent at Wounded Knee where print artist and 2018 Artist in Business Leadership fellow Micheal Two Bulls spoke about the history of the area. 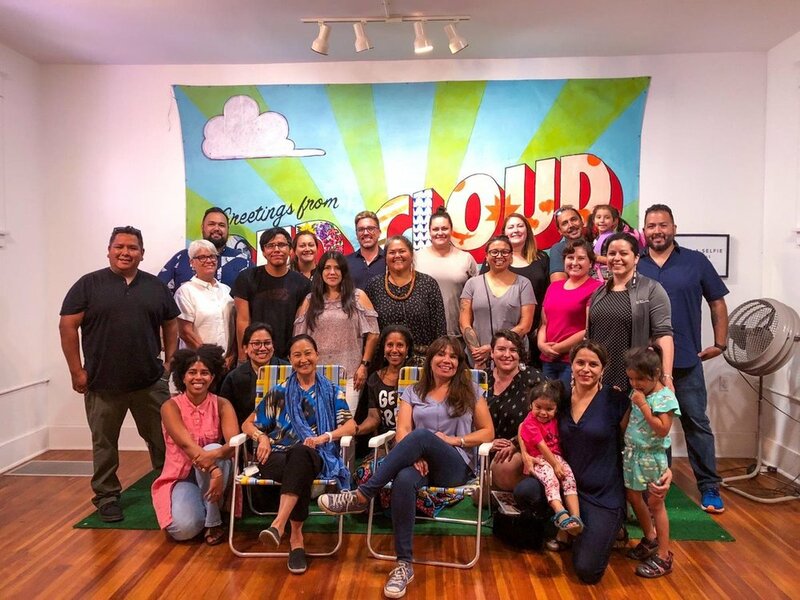 Those who attended the REMAP: Pine Ridge program came to know more about the arc of history that serves as context for today, and how the resilient practices of Lakota artists and culture bearers are foundational to the future. While the participants in the program came to a better understanding of Lakota people’s history and their story today, those hosting felt change within themselves as well. The REMAP: Pine Ridge program was supported by the Bush Foundation, Ford Foundation, Hewlett Foundation, and HRK Foundation.